﻿Timing may be decisive when it comes to overcoming cancer's ability to evade treatment. By hitting breast cancer cells with a targeted therapeutic immediately after chemotherapy, researchers were able to target cancer cells during a transitional stage when they were most vulnerable, killing cells and shrinking tumors in the lab and in pre-clinical models. The team reports its findings in the journal Nature Communications. Previous studies have examined cancer stem cells (CSCs) - small populations of cells within a tumor that are resistant to chemotherapy. The researchers took breast cancer cells that did not have the markings of CSCs and exposed them to docetaxel, a common chemotherapy drug. The team found that after exposure to chemotherapy, the cells began developing physical markings usually seen in CSCs, including receptors on the cell surface to which specific proteins can bind. These "markers of stemness" suggested that the cells were transitioning into a different state, during which time they might be vulnerable to other cancer drugs. To test this, the researchers treated the cells with a variety of targeted therapeutics immediately after chemotherapy. 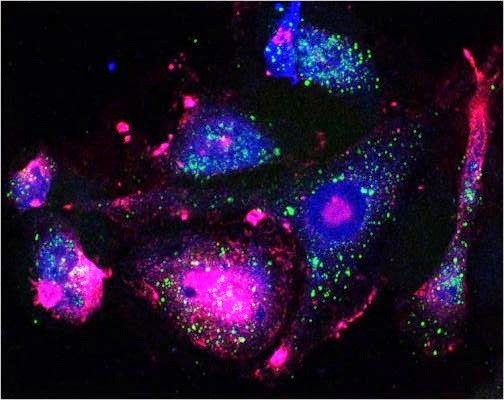 They observed that two drugs each killed a large fraction of the cells that had begun transitioning: dasatinib, a drug that targets the Src Family Kinase (SFK) and RK20449, a new drug in pre-clinical testing that specifically targets one of the SFK proteins called Hck. The researchers confirmed these findings in a mammary carcinoma mouse model - treatment with dasatinib just a few days after administering two high doses of chemotherapy prevented tumor growth and increased survival rates. Treating cells simultaneously with docetaxal and dasatinib or administering dasatinib after a longer period of time did not produce the same effects. The researchers theorize that the cancer cells go through a temporary transition state, which means that administering the drugs in a very specific timeframe and sequence is important. Now, the researchers continue using mathematical modeling to pursue the most effective dose of chemotherapy to induce the vulnerable transition state of the cancer cell demonstrated in this research. Their goal is to build a regimen that will be efficacious for clinical trials. Based on material originally posted by Brigham and Women's Hospital.